One of the latest trends for mamas is dressing up your baby in a monthly onesie. 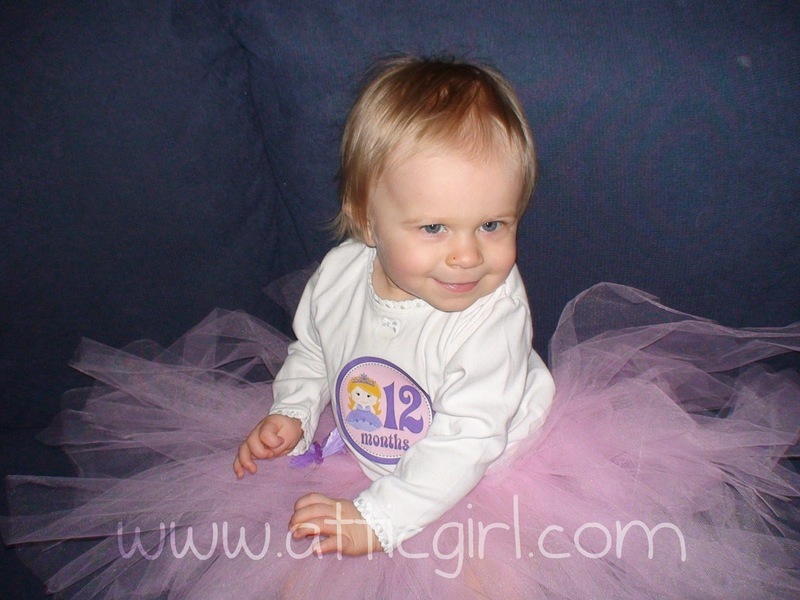 It makes an adorable photo op and is a wonderful gift idea for baby showers. However, it can be a bit expensive to purchase a onesie that is printed or stitched for every month of baby's first year. I have seen boutique type shops sell them for $50 and up! Not to mention in baby clothing, sizing can vary and these onesies might not fit when your child reaches that particular month. The monthly onesie sticker is a more affordable option, especially for moms on a budget. I was contacted by Buddha Bellies to do a review of their onesie stickers. And I must say, I regret not having these right when baby girl was born! 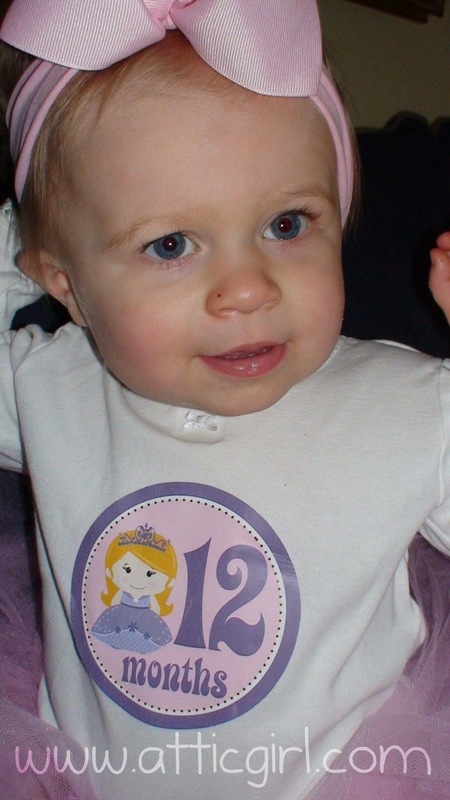 I used this princess sticker for baby girl's 1st Birthday outfit. I'm biased, but I think she looks adorable! The sticker perfectly matched the colors in the tutu. Her grandparents loved it and I have had many compliments from friends as well! You should know that these are intended for photo opportunities, not all day wear, and are not made to stand up to an active baby. But they are on waterproof and "drool proof" paper so the colors do not bleed. I love the easy peel and stick convenience (and cost-effectiveness) and can't wait to use my 2nd year stickers! You can purchase stickers online through the Buddha Bellies Etsy shop. You can also keep up to date on their latest designs on the Buddha Bellies Facebook page. Want to win stickers for yourself? GIVEAWAY: One of my lucky readers is going to win 1 set of onesie stickers from Buddha Bellies! Visit Buddha Bellies and tell me which set you would choose. This giveaway Ends 1/19/12 at 12 Midnight EST and is open to US Residents 18 and older only. Winner will be chosen randomly, emailed, and will have 48 hours to respond or another will be drawn. This prize will be directly shipped from the sponsor. Disclosure: I received one or more of the products or services mentioned above for free for the purpose of review. Regardless, I only recommend products or services I use personally and believe will be good for my readers. The sponsor is responsible for shipping this prize to the giveaway winner; I will not be held liable for any lost or not received prizes. 36 comments on "Buddha Bellies Monthly Onesie Stickers Giveaway"
I love the Monthly Onesie Stickers...Fireman, Fire Fighters. I LOVE these! It's tough to choose just one. I love the primary colored trains stickers and also the Lions, Elephants, Alligators, Giraffes set. So cute! I follow you via twitter as janj4c. I would choose the "Your Little Sailor" but for the 2nd year! I would choose the "Pretty Owls" stickers! i love the bright pink ones!